Can a Beard be too Long? No beard is too long! In my personal opinion, I find that the longer the beard the more it becomes a centerpiece. A lot of people are going to give you grief for this. However, for myself personally, isn’t this why we as men started to grow a beard in the first place? These may be considered basic concepts, however, they rarely are considered or entertained. Just like the fairytale, “Goldilocks and the Three Bears” There are three main things to consider when it comes to the length of a beard. You should consider when to trim it, when to let it be, and when to set it free. There’s a distinct difference, between simply growing a beard of epic proportions and crafting a gigantic masterpiece of beauty. There are various reasons why you should trim your beard. A good indication of that is if your beard met with jests and taunts from the bearded community. Additionally, if your beard does not fit your face or hairstyle. Below I have listed three main reasons you may need to trim your beard. It is important to note, however, that these rules are just guidelines and should not be considered the know all, be all in rules to consider for trimming your beard. “Let it grow, let it grow! A good beard never bothered me anyway"
That is if your beard starts to lose its neat shape. Your beard should have one of two different shapes to it. Rounded at the bottom or straight across. Now as a disclaimer there is the pointy ones. However, that is still rounded; just a more elongated roundness to it. Second, is when the compliments stop coming in. You may have noticed when you first started growing out your beard you would get compliments from women and men alike. However, now that it has become longer, the only people you get compliments from are other bearded men. Now this does not mean your beard cannot be long. I still get complimented everywhere I go and as you may tell my beard is very long. The compliments stopped coming in because it looks unmanaged. All you need to do is clean it up some. Third, is when it does not fit your face or your hairstyle. I do not follow this myself. However, I have a style that remarks my heritage. My designer clothes and Nordic look makes me look trendy and that fits. Below are a few concepts to keep in mind. 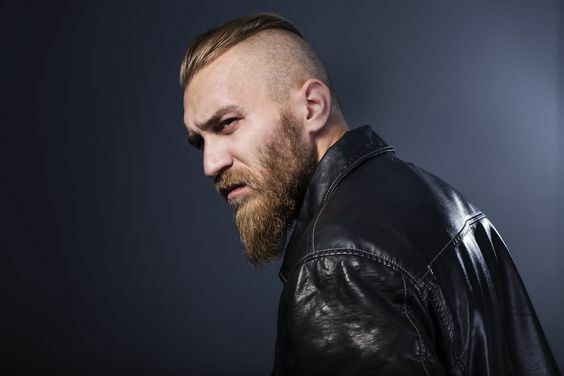 Short hair: Longer, thicker beards generally best suit shorter hairstyles. Medium hair: medium hairstyles have the potential to suit almost any beard length. The key is make sure your beard is tidy and well kempt. Long hair: Shorter beards generally suit longer hairstyles. They will contrast one another in a positive manner and generally blend smoothly as opposed to overwhelming. Long hair and long beards are a very hard combination to pull off. And tend to require the most effort. I know from my own experience. No hair: You owe it to yourself to go full Bandholz if you’re falling short on top. Your beard will detract away from other areas you may not want to accentuate and draw attention to my desirable areas. You should maintain your beard and keep it trimmed when it has met your desired length. Only you will know when that will be. There are many reasons why you might want to keep it at the length it is. However, here are a few reasons you might desire to keep it that way. Are you following a hairstyle you found on Pinterest? If so, and your desired look has been accomplished you may want to just maintain it and as it becomes unmanageable just trim it to keep the desired look. Is your beard a staple of your Beard Identity? I wrote an article last week entitled: “Make Your Beard Your Brand – A Business Approach to Beards” where I discussed that beards become your identity and that you should maintain it if you have achieved such status. I myself am known as “The Beard Viking” and “Business Thor”. This is my Identity and that works for me. However, if the identity is one you do not desire you may want to consider trimming it. We are not talking about letting go of your beard. We are referring to the concept of letting a beard grow out. Just like mentioned above. There is a Beard to hair ratio. As such if it does not meet the criteria of letting it be or trimming it you should own it and let it grow you Bearded Elsa. With beards being so mainstream and also the source for much discussion and debate, it tends to be a conversation starter. If you are not an anti-social person and want to have social interaction you may want to grow out your beard. I hope you guys enjoyed this article. This is in fact not a Be All guide and only suggests reasons to Trim, Keep or Grow out your beard. There are a lot of perceptions on Beards and why to lose them or keep them. Only you can truly know what is best for your beard. We at the Beard Struggle only would like to help you make a well-educated decision on the outcome of your beard. We can provide tips, trick, and techniques to help you achieve your Desired Beard. Thank you for the reply, I personally can attest to this fact. They may not like it now, however, and not to divulge too much, she will like how it feels on her skin. Trust me, she will . Just tell her to give it a chance. She will fall in love with it. Women secretly like Men, not Boys, LMAO. That and you have the inside edge. Good luck and hit us up if you have any questions. Beard On! Beard Struggler! I just started to grow my beard this Friday I and many of my family can’t grow a beard but for some reason or another I am not letting that stand in my way of charge to grow a beard. I have a style that I am going for just like it says in the article and I not giving up Intel this goal is met. The wife does not like this fact but I am sure she will approve when see she this beard.